Inspired by the beauty and delicate structures found in the natural world I create sculptural jewellery and silversmithing. Working in precious metals such as Silver and 18ct Gold my jewellery comprising of hand pressformed and individually fabricated units combined with subtle surface textures and contrasting finishes to create unique pieces of fine jewellery. In one of my most recent ranges the metal is rolled with lace, capturing the delicate pattern. Pierced holes accentuate the imprint of the lace. 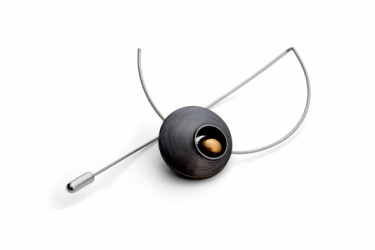 My silversmithing work focuses on creating functional and aesthetic pieces that are designed for contemporary living. Using Sterling and fine Silver each piece is created using traditional Silversmithing techniques. In handraised pieces the marks from the process of making are left in to create a natural tactile quality, in other pieces the marks are worked out to leave a sleek modern finish. I also work to commission creating individual pieces to suit clients requirements whether it be a contemporary engagement ring, a special birthday present or a piece of silversmithing, such as a silver cake slice, to mark an occassion.